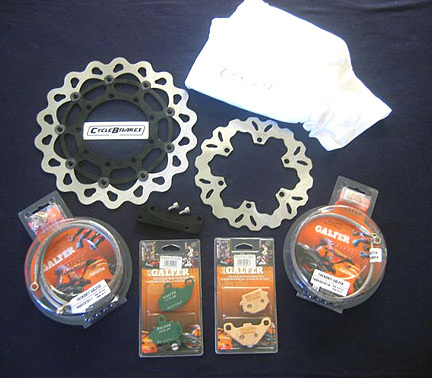 Galfer brake pads in Black $25.99, HH $33.99 Blue and Green $33.99 per caliper. On sale now! Ultimate brake set up for aggressive & true dual-sport, KLR 650 riders is Galfer Green in the Front and HH in the Rear – although we use the Black with our Wave Rotors for local street-only commuting. Galfer stainless steel brake cables Don’t miss a huge change in feel at the lever. Get these brake lines and help stop mushy brakes. KLR 250 Galfer Front Line: #FK003D461, $64. Inquiries: Call 1-800-805-2118 M-F or email sales@cyclebrakes.com . Anyone who has ever ridden a KLR knows that the brake system on these machines is less than effective. That is why Cycle Brakes, in conjunction with Galfer, has manufactured a rotor specially designed with the needs of KLR riders in mind. Our kits come complete with the oversized, 320 mm rotor, caliper adapter bracket, and mounting hardware. Comes equipped with the oversized front wave rotor, rear wave rotor, Galfer brake pads, in your choice of compound, with front and rear steel braided brake lines. All this for only: Combo price coming soon + FREE T-SHIRT. *Shipping not included. **Caliper Relocation Bracket is included! Please call us today 1-800-805-2118 to add your name to the notification call list... new batches & pricing coming soon! SALE: Add pads to Front or Rear rotor purchase at reduced prices! Galfer Semi-metal and $20 for Galfer Green or HH 28. "G1" 1986-2007 KLR Rear Galfer Wave Rotor- Sale $135 (MSRP $139). Wave design creates better performance with progressive feel and excellent cooling features. SALE: Add pads to rotor purchase at reduced prices! We accept Visa, MasterCard, Pay Pal or COD payments ( money orders/ cashier's checks only).